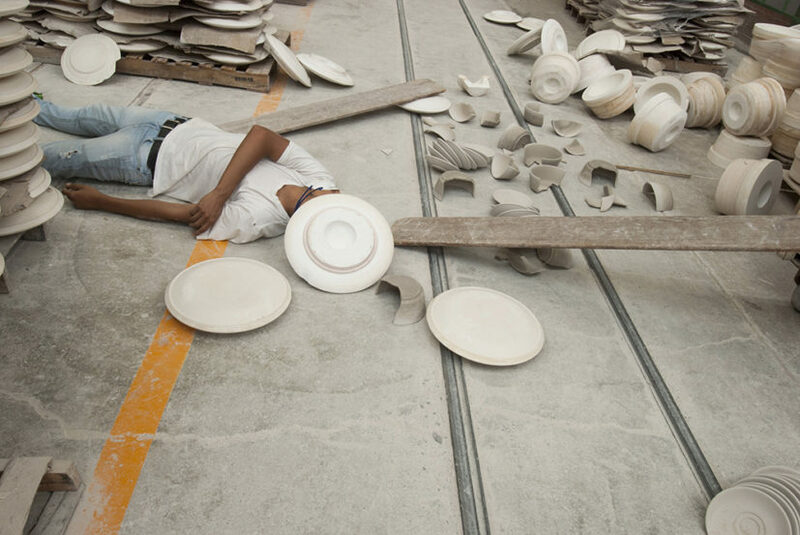 Still from a performance with workers at Anfora ceramics factory, Mexico. © Jeremy Hutchison, 2016 . This will exhibit at Zona Maco in Mexico City in February 2017. Jeremy Hutchison (b.1979) lives and works in London. After studying linguistics, he worked for Coca Cola on their advertisement campaigns and only later enrolled into art school, receiving a distinction from the Slade School of Art. An unusual background for an artist who was also part of the prestigious Whitney Independent Study Program in New York, these experiences have been helpful to develop a strong, conceptual practice dealing with notions of consumerism, labour and workforce. At a time when discussions about labour are being openly debated within the art world (consider Walid Raad and Ashok Sukumaran’s work at the 12th Sharjah Biennale, as part of the Gulf Labor Artist Coalition), Hutchison’s concerns are current, complex and engaging. You might have seen his performance at Chisenhale Studios last week that used ‘Task Rabbit’, an app that allows you to outsource part-time jobs and tasks. Hutchison invited four workers from the app over to create a mural as if they were a single person. He later discussed with them ideas around solidarity, asking them about their fragmented work conditions and using this performance to highlight how an artist’s work might be valued within expanding theories of labour. Dynamics of power are what Hutchison is really committed to, using the absurd to question how the rational functions. He mentions Charlie Chaplin and Buster Keaton as figures that were humorously questioning how the rationality of the rapid modernisation in the early twentieth century imposed an order upon society that radically transformed human existence. 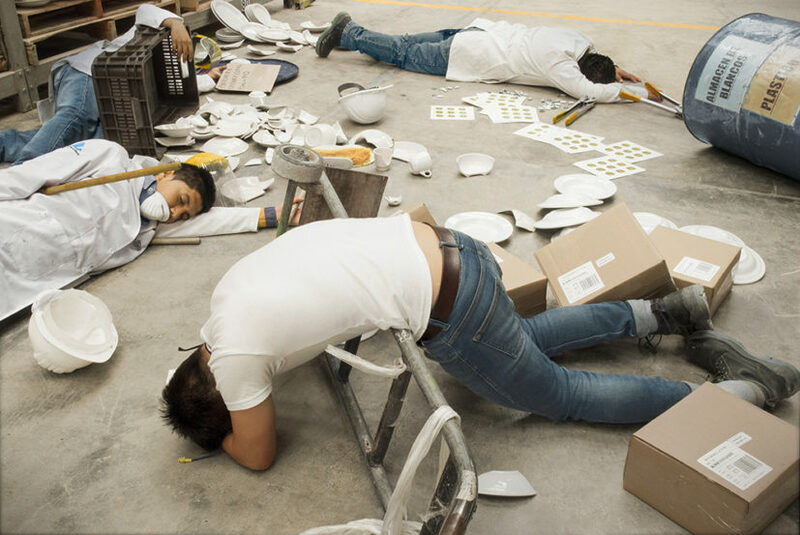 A century later these questions are still pertinent: his show Monster at THE RYDER Projects last September examined the everyday tasks of those working in a factory in the Middle East. Hutchison asked workers to simulate their work packing peanuts but without the nuts themselves, exposing the repetition of their gestures, the choreography of their labour, the politics of abstract labour value. Hutchison’s reasoning on the means of production is strictly interlinked with their possible sabotage. 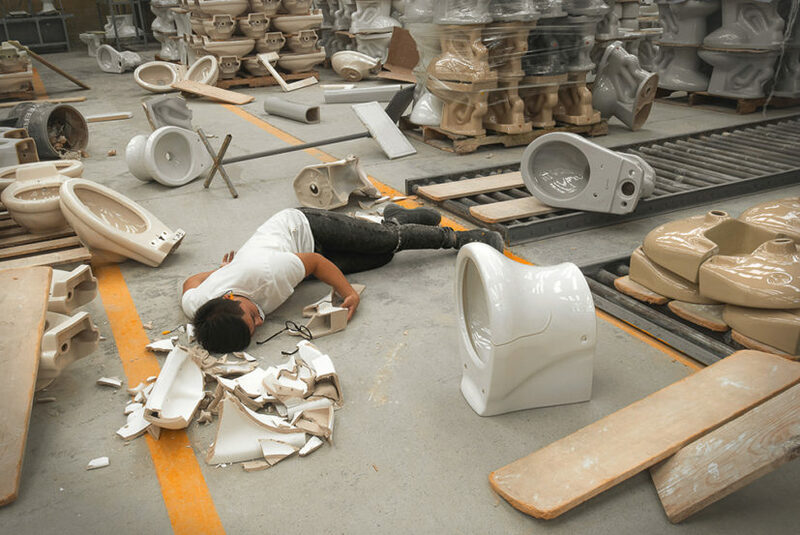 Another work explors indigo mining in Palestine and he is preparing a new project in one of the largest ceramics factories in Mexico, which will be shown at the Mexican art fair Zona Maco in February 2017. To be so thoroughly engaged with the lived conditions of others, as well as the contemporary inequalities that pattern work and rest, shows an artist committed to investigating the systems of value in which he is entangled. So let’s watch what Jeremy Hutchinson will do after his residency at Hospitalfield in Scotland, where he is currently taking on linoleum and its manifold uses across capitalism and socialism. The work will be exhibited in Kirkcaldy Galleries next spring, the town where in 1776 Adam Smith wrote The Wealth of Nations, the source code of modern capitalism. A nice coincidence matching Hutchison’s interests or a deliberate association?